Cat Oval - $29.30 (in store)This kitty is walking through a lovely garden on her morning stroll beneath the birdhouse. The flowers are in full bloom and the dragonfly is landing for a rest. 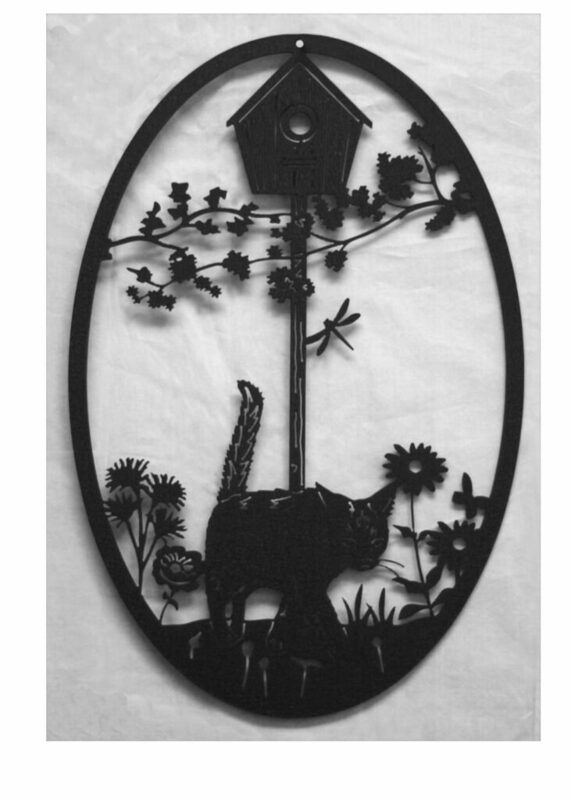 There is a lot happening in this 16" Oval - a beautiful silhouette that is a great gift for yourself or the perfect gift for the cat lover that you know. The powder coat color Black Wrinkle is an elegantly textured black with soft slate metallic shimmering undertones and matte finish. 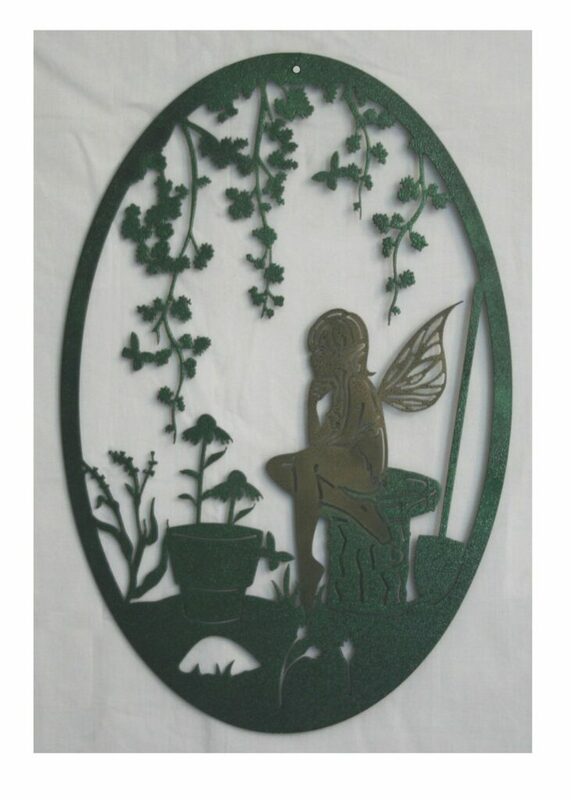 Fairy Oval - $29.30 (in store)The Garden Fairy has some quiet thoughts as she sits in her garden taking in the beauty of the summer flowers. You can enjoy the peaceful scenery too - she will fit well on any wall in your home, sunroom or even in your garden on the fence. The garden scene and frame is powder coated in Green Vein, a slightly textured deep green with no undertone and a semi-gloss finish. The fairy is powder coated in a rich Gold Vein, slightly textured antique gold having rich deep brown subtle accented undertones, and she is also made with two layers of metal. 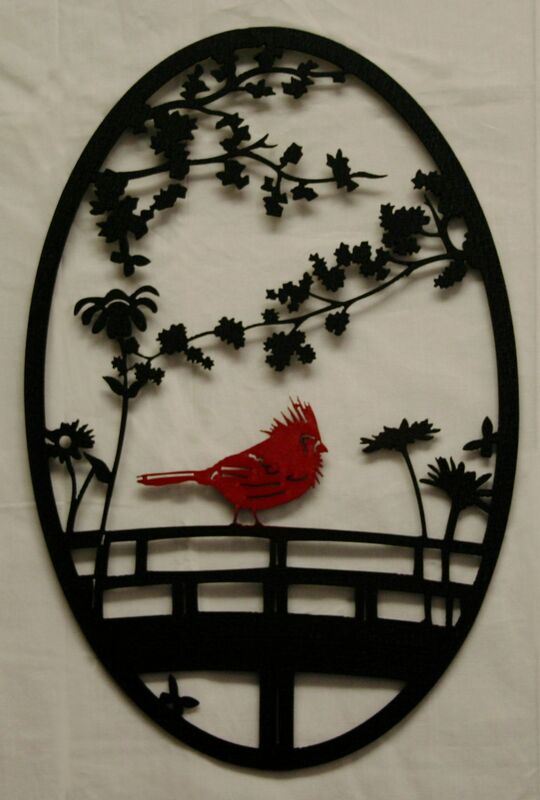 Cardinal Oval - $29.30 (in store)A deep red cardinal perches proudly on the fence in the garden to sing his tune. The chic style of this quaint scene brings delicate natural details to your space. This piece is mostly powder coated in Black Wrinkle, a deep black, slightly textured with a matte finish. The cardinal is Red Wrinkle, a softly textured deep red with shimmering undertones and a matte finish and two layers of metal. 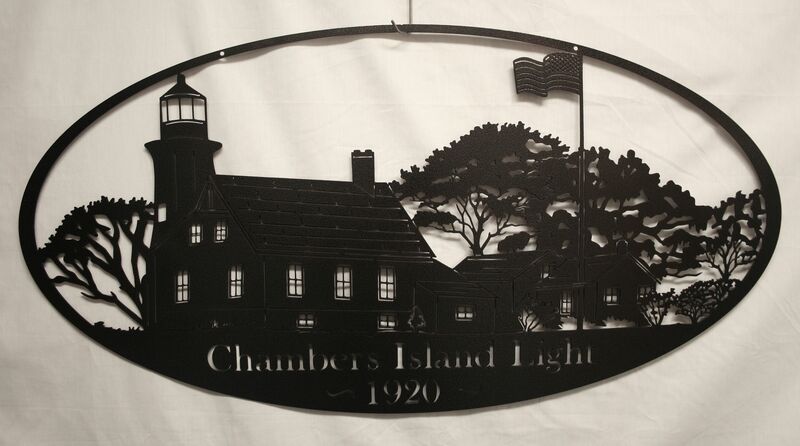 Chambers Island Light - $72.60 (in store)This oval has been created from a photo taken around 1920. The Chambers Island Lighthouse was located in the Bay of Green Bay, about six miles west of Door County, WI. Lighthouses, along with their keepers, have a rich history along any stretch of our coastline. Life was not easy for these families but they dedicated themselves to keep the sailors from harm. You can proudly display this piece of history in your home or office. The powder coat color is Copper Vein is a textured, rich, deep brown with slight black undertones with a semi-gloss finish. 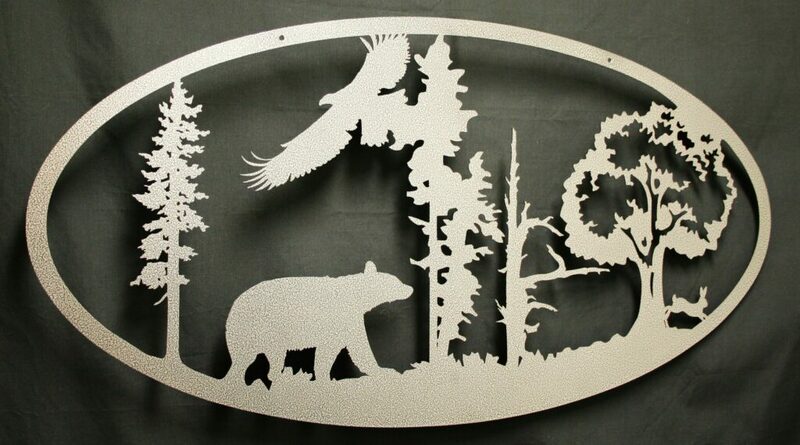 Bear/Eagle Oval - $54.45 (in store)The focus of this oval is the big woods. The resourceful bear on the prowl for food along with the majestic eagle keeping an eye on its territory. A great addition to any nature lovers collection! 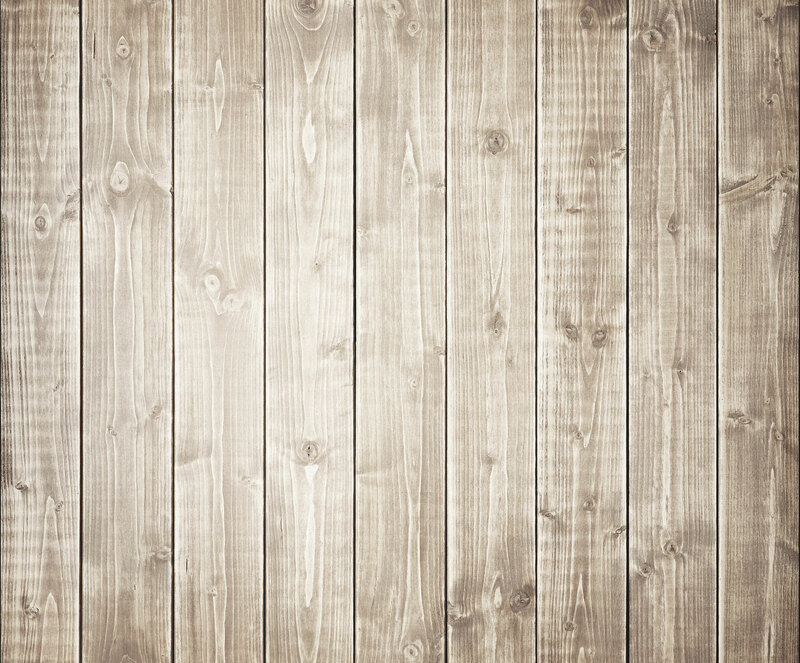 The powder coat color is Silver Vein which is a textured silver with slight black undertones with a semi-gloss finish. Model T & Horses Oval - $60.50 (in store)A gentle, peaceful scene shown in fine detail of an afternoon drive through the countryside in this oval. The vehicle drives along a wooden fence with horses in the background enjoying fresh grass out in their pasture. You can easily picture yourself out for the drive with a gentle wind coming in through the windows on the sunny afternoon. The Model T & Horses oval powder coat color is Copper Vein which is a textured, rich deep brown with slight black undertones and a semi-gloss finish. 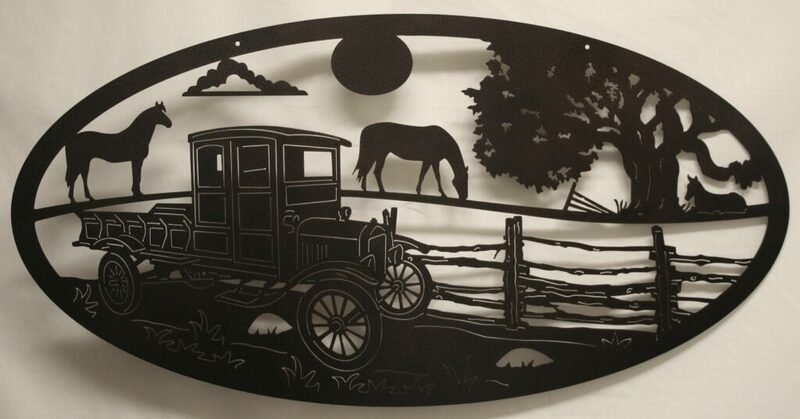 Model T Oval - $60.50 (in store)The scene on this oval is set out in the countryside and shows in great detail the Model T Truck sitting in the yard along the fence and under the tree with beautiful mountainous landscape in the background. The powder coat color is Copper Vein which is a textured, rich, deep brown with slight black undertones with a semi-gloss finish. 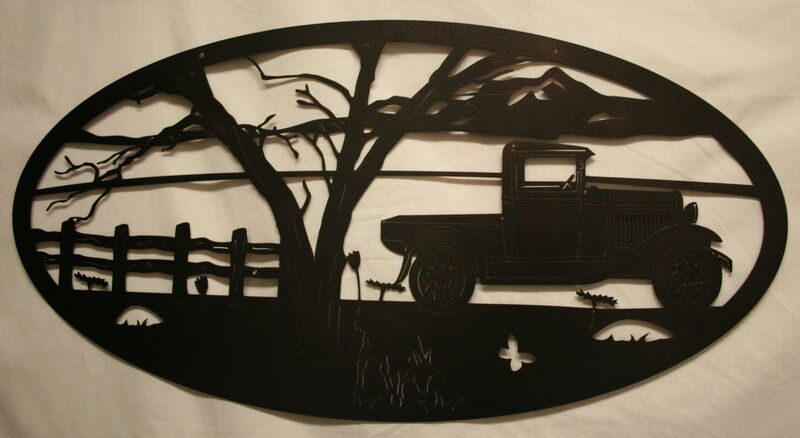 Countryside Drive - $60.50 (in store)This oval displays in great detail an old truck tucked in a beautiful country scene along with an old wooden fence and trees. 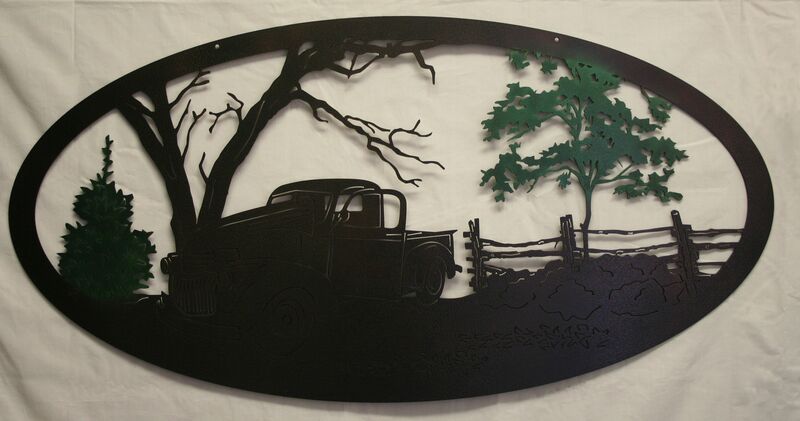 The scene is powder coated with two different colors; the two trees are in Green Vein, a slightly textured deep green with no undertone and a semi-gloss finish and the truck along with the rest of the scene is powder coated in Copper Vein, which is a textured, rich, deep brown with slight black undertones with a semi-gloss finish. 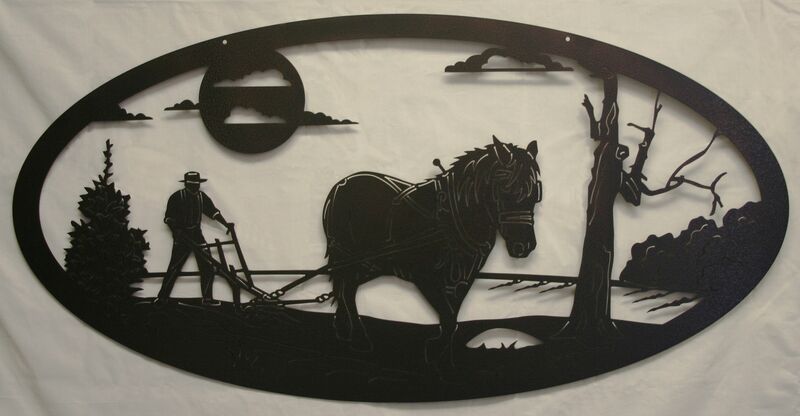 Plow Horse Oval - $60.50 (in store)he mighty plow horse pulling the plow turning the soil to plant the next crop. The farmer hangs on tightly to the handles to make the rows straight working under the hot noon day sun. Not an easy life but certainly a big part of our history! The powder coat color on this oval is Copper Vein which is a textured, rich, deep brown with slight black undertones with a semi-gloss finish. JD Tractor Oval - $72.60 (in store)Life on the farm is busy from sunrise to sunset and the tractor is one piece of equipment that does more than its fair share of the work. 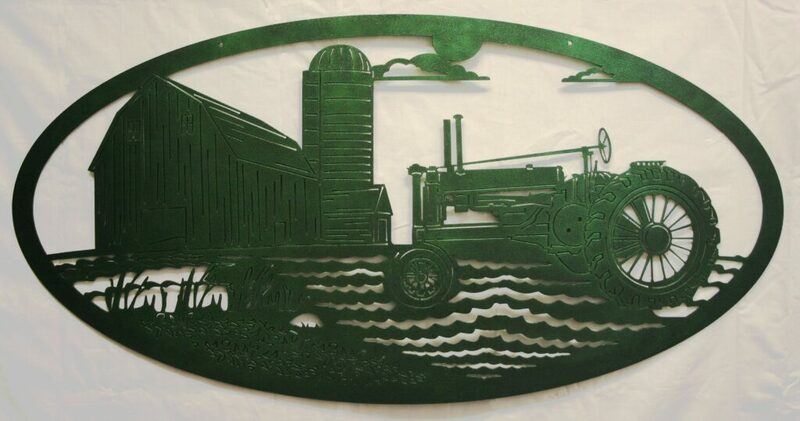 For those who love farming or for those that have fond memories of growing up on a farm this oval scene shows in detail the tractor waiting to finish the job in the field with the barn and silo in the background. The oval is powder coated in Green Vein, a slightly textured deep green with no undertone and a semi-gloss finish. 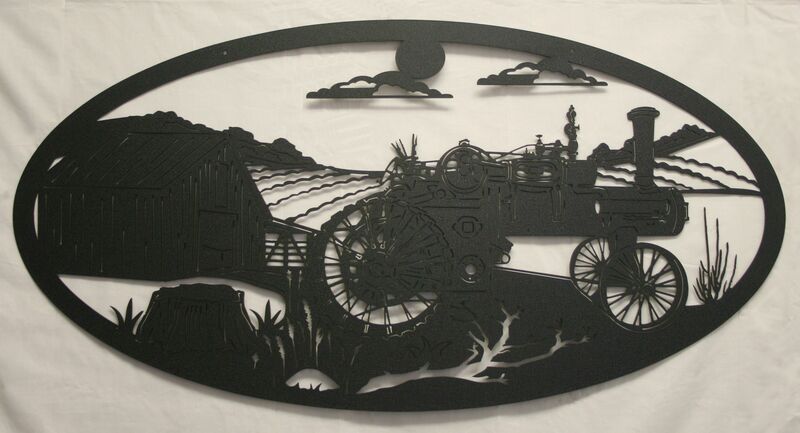 Steam Tractor Oval - $72.60 (in store)From horse power to the industrious steam tractor - this beautiful oval gives you in fine detail the steam tractor set in the field in the foreground along with fields and rolling hills in the background. The powder coat color is Black Wrinkle which is an elegantly textured black with soft slate metallic shimmering undertone with a matte finish. 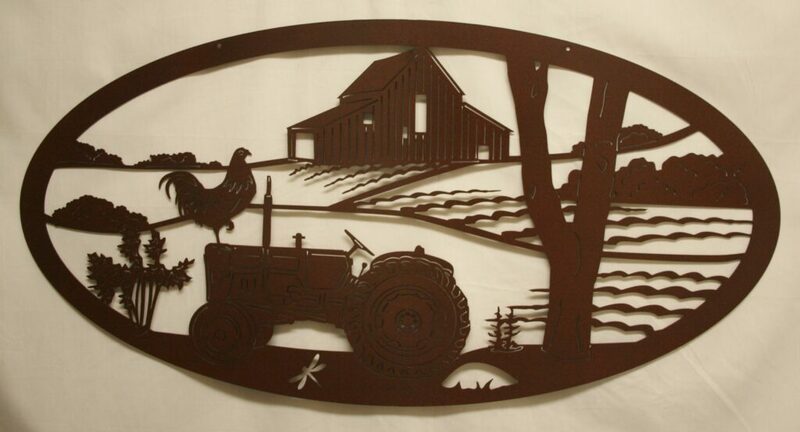 Farm Tractor Oval - $60.50 (in store)This scenic oval brings life on the farm in great detail with a Ford tractor in the field in the foreground, a barn in the background and field in between. And you can't miss the handsome rooster keeping watch over the farm! The powder coat color is Rust Vein which is a slightly textured, deep rust brown with a semi-gloss finish.